An SSH tunnel allows you to route traffic through an SSH connection. It encrypts the traffic and routes it from a port on one computer to a port on the remote computer. It’s also called SSH Port Forwarding. To perform port forwarding we add a switch such as -L or -R.
Your work firewall is blocking traffic to the google.com domain. You have a host at home running an SSH server at 84.4.55.12. You can access your home PC through the work firewall. 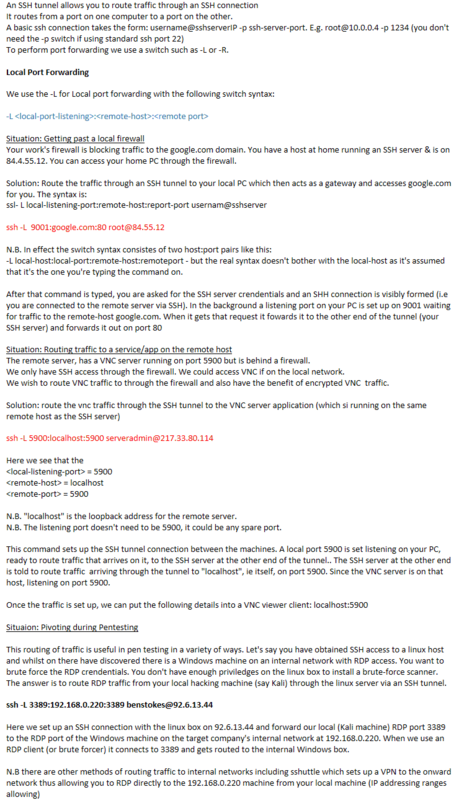 Solution: Route the traffic through an SSH tunnel to your local PC which then acts as a gateway and accesses google.com for you. -L local-host:local-port:remote-host:remote-port – but the syntax you use doesn’t bother with the local-host in these examples, as it’s assumed that it’s the computer you’re typing the command on. But it’s worth remembering this as the syntax is otherwise rather confusing, or it is for me anyway. N.B. “localhost” is the loopback address for the remote server. N.B. The listening port doesn’t need to be 5900, it could be any spare port. This command sets up the SSH tunnel connection between the machines. A local port 5900 is set listening on your PC, ready to route traffic that arrives on it, to the SSH server at the other end of the tunnel. The SSH server at the other end is told to route traffic arriving through the tunnel to “localhost”, ie the host it is running on, on port 5900. Since the VNC server is on that host, listening on port 5900. This routing of traffic is useful in pen testing in a variety of ways. Let’s say you have obtained SSH access to a linux host and whilst on there have discovered there is a Windows machine on an internal network with RDP access. You want to brute force the RDP credentials. You don’t have enough privileges on the linux box to install a brute-force scanner so you want to run this on your local machine. Solution: Route RDP traffic from your local hacking machine (say Kali) through the linux server via an SSH tunnel. Here we set up an SSH connection with the linux box on 92.6.13.44 and forward our local (Kali machine) RDP port 3389 to the RDP port of the Windows machine on the target company’s internal network at 192.168.0.220. When we use an RDP client (or brute forcer) it connects to 3389 and gets routed to the internal Windows box.